While strolling down a less populated part of Bangkok, we stumbled upon a small and quirky cafe – Bangkoku Cafe, which immediately sparked our interest. Located just beside one of Bangkok’s most popular old-school barbers – Good Old Days Barber Shop – we were delighted by the cosy cafe’s reasonably priced drinks. Sprawled on the walls are various menu items, from typical coffee to some very interesting alcoholic cocktails. Although this cafe has a limited food menu of a few cakes and sweet treats, the great drinks were enough to keep us happy. With so many overly-publicised big cafes in Bangkok, it was nice to see a simple and humble cafe like Bangkoku Cafe. A non-alcoholic drink here costs THB35 to THB50 (S$1.40 to S$2), with frappes just THB10 more (S$0.25). Served to us in beautiful mason jars, Bangkoku Cafe offers a nice an intimate setting for us to rest and relax after a long day of sightseeing and shopping. The Thai Iced Tea (THB45, S$1.80) is a typical choice but with no regrets. We also had the Lychee B*tch (THB90, S$3.60), an alcoholic cocktail with a spunky name that was extra refreshing and can also be served ice blended, upon request. We tried the cake of the day that came in a cute mini portion, just enough to satisfy our sweet tooth. For an extremely unpretentious cafe experience, Bangkoku Cafe pretty much fits the bill. Great drinks, simple cakes, no crazy crowd. 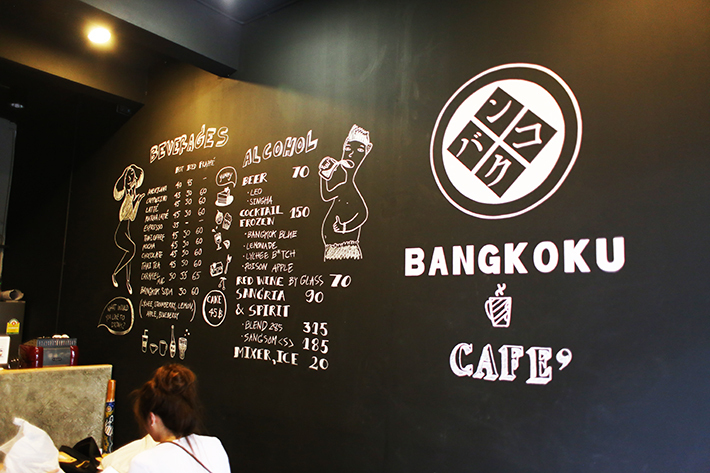 For more recommendations, read our guide on the best cafes in Bangkok. It would be great if you could include GPS as thai street name is extemely difficult to locate. Just my thought.